Great review, Will. Not read this one myself, but it sounds intriguing. Have you read any Hemingway? It sounds very influenced by him. Both in subject matter and to a degree in style. Thank you all for the comments. It was a nice little read this one; actually nice probably isn't the right word given how unsympathetic the protagonists are, but it was an effective look at a couple of flawed (as you say Stu) men. I haven't really read any Hemingway, Max, which is what prevented me from mentioning him in the review although I've since seen the comparison made elsewhere. I've thought often of reading The Old Man and The Sea. Is that a good place to start? Lovely review, Will. It sounds an interesting book and the way you describe the exchanges between Danny and Robert make it sound as if the author has really succeeded in capturing the tentative development of male/male friendship - so different from the more rapid/gushing closeness between women. I wonder if as well as the metaphor of the boxing ring being like the bull charge, the author also intended readers to draw a parallel between the bulls' fervour and ensuing death with the way some men hurl themselves passionately into other aspects of life and love without considering the long-term sequelae. Great review as ever, thanks. I wasn't actually a huge fan of Old Man, but it is very short. I started on A Farewell to Arms which I thought was excellent. 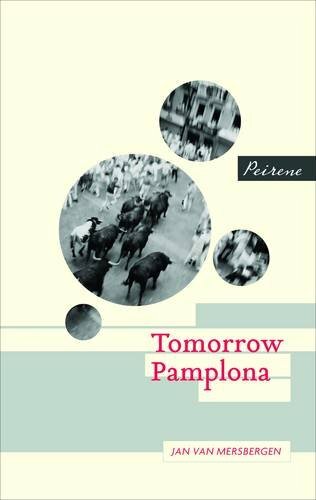 I've also read The Sun Also Rises which takes place in part in Pamplona at the bull run. That was good too. Those three are all the ones I've read so far of Hemingway. Old Man is the easiest, but I found Sun (also known I think as Fiesta) and Farewell better books. Max - brilliant, thank you. Leyla - there is definitely something hot-headed about Danny. I avoided going into any more detail about that in the review to avoid spoilers but your perception is spot on. I presume by 'sequelae' you meant 'consequences'! This is the one Peirene book that I haven't read yet and for some reason currently I am not so drawn to it. I dont know if its the idea of the bull fighting or what but something isnt tickling my tastebuds with it. Though your review has made it sound rather good, so maybe I should... erm, take the bull by the horns lol. Great review. I found it a very masculine book, and having read 'The Sun also rises' was bound to compare it to Hemingway. I've now read three of his, and really enjoyed them - I like his style of writing, although TSAR does get a bit repetitive with all the drinking, drinking and drinking. Hi Simon. This wasn't my favourite Peirene title but a good read nonetheless and I'd be intrigued to know your thoughts if you did read it. As Annabel says it is a very masculine book and the more I think about how unsympathetic the male characters are the more amazed I am that I did in fact invest something in them. Annabel - isn't there even some mixing of drinks to vary things a little? !